I like bikes. I spend a lot of time riding, but also enjoy working on bikes. Since I live in Indiana, I spent years mostly just riding around on country roads, but have recently begun mountain biking frequently. I'll occasionally ride with 3 Rivers Velo Sport, the Delaware Cycling Club, or the guys from Kirk's Bike Shop. I also regularly ride my unicycle on the local mountain bike trails. 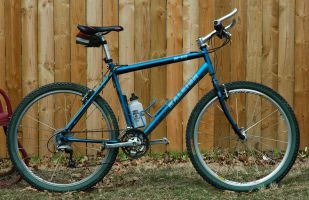 My Vitus 979 page is fairly popular, so I created a page for information on Vitus and other people's Vitus bikes. I wrote a short page on driving safely around bicyclists, including animations of safe and dangerous passing. I also posted a short article on foot position on pedals, which is particularly useful for new unicyclists. I own two bikes. My main bike is a Cannondale CAAD8 road bike. I ride a Raleigh M-60 for commuting and off road. Most of my bicycling in recent years has been on my Cannondale CAAD8 with SRAM Rival components. I needed to replace some parts on my Vitus, and found this bike on model-end clearance for not much more than I would have spent on parts. The ‘Handmade in the USA’ aluminum Cannondales were by far the most bike for the money in recent years. The components were also a good deal. I'll take the usability and repairability of SRAM Rival over Ultegra any day, plus Rival is lighter, and less expensive. I think the CAAD8 is a very comfortable ride. My position on the bike is about the same as it was on the Vitus, but since I got the CAAD8, my definition of long ride has at least doubled. There is a newer model also called the CAAD8, but this is not the same bike. The original CAAD8 that I own is a Handmade in the USA racing bike. The current CAAD8 is a noticeably lower quality Asian frame with some tweaks for recreational riders. 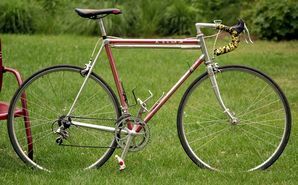 It is a good entry road bike, but is not the amazing deal the original CAAD8 was. The Raleigh M-60 is a good bike. It isn't too heavy for a non-race-oriented steel mountain bike. The M-60 originally came with Shimano STX/STX-RC components and Dia-Compe brakes and levers. I (2007.3) upgraded to a Shimano Deore 9-speed derailer and a SRAM Centera rear shifter. I am on my third pair of wheels. I trashed the original wheels after unexpected contact with a tree. The second rear wheel had bearing problems. After only a few hundred miles, one of the ball bearings disintegrated, ruining the hub. I then upgraded the rear wheel to a Mavic Crossride, and upgraded front wheel's ball bearings and cones. Last year (2011) I also replaced the front wheel with a Mavic Crossride. I have been much happier with the Mavic wheels than my previous wheels. After a crash of similar intensity to the one that destroyed the factory wheels, the front Crossride wheel only needed a slight truing to meet my high standards. After owning this bike for a couple years, I got bored with the few trails in the area and didn't ride off road as much as I used to, so my M-60 spent most of its life as a commuter and bad weather bike. In the past couple years, I started playing on the local trails occasionally, and have started riding off road frequently this year (2012), spending much less time on my CAAD8. I ride a Kris Holm MUni on the local mountain bike trails. The large tire gives a relatively smooth ride, but since it is a unicycle, any trail can be a challenge. This unicycle is the 2007 model with the 38mm (double width) XC rim, a 2011 KH Fusion Street seat (shown with a 2006 KH Fusion Street seat), Nimbus Venture cranks, plastic pinned pedals, and a Specialised 29x2 tire that is 2.1 inches wide on this rim. This bike is a late 1980's (1988?) 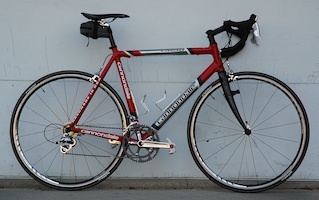 French aluminum road bike with a Shimano 600 group and Mavic tubular rims. This bike now has its own page. 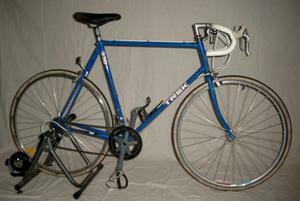 The Trek 330 is an old light touring bike. This bike now has its own page. I had a Schwinn Traveler. It is an old twelve speed that I used for riding around campus. It is a bit small for me, but I rarely rode it more then a two-thirds of a mile, so that is OK. Unfortunately, some looser stole it. I found it after a month, but some of the parts were really messed up. I ended up replacing parts and rebuilding the bike. With the new parts, the drivetrain runs as smoothly as my Trek 330. I sold the Traveler to my brother. Because the Traveler has a long top tube compared to the seat tube, he was able to put a longer seatpost on it, making it into a decent compact frame bike. 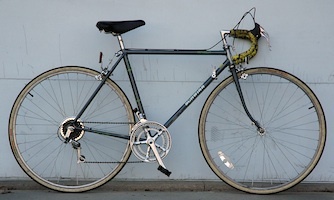 The Schwinn Passage was a touring bike made in 1986 of Columbus Tenax tubes. I believe Tenax is slightly thicker Columbus SP tubing. This model was only made for one year. It was Schwinn's top touring bike, but with slightly heavier tubes. Even after years of abuse, the Tioga Expert CP headset was still in great condition. Immediately after getting this bike, most of the components were moved to a smaller frame to build a replacement for a roommates stolen bike. After reading Sheldon Brown's articles on fixed gear cycling, I was going to turn this into a fixed gear commuter, but could never justify the cost of decent components. After years of sitting in a closet, the great fixie fad happened; so I sold the frame and started unicycling. Once I learned to ride a unicycle, I bought a 2006 Nimbus MUni to ride the local mountain bike trails. This is a basic unicycle frame with a SunRims Rhino Lite mountain bike rim, 152 mm cranks, and a 2006 Kris Holm Fusion Street seat (shown with a 2007 Kris Holm Fusion Freeride seat). This is a good unicycle, but I prefer a 29 inch wheel, so I sold this to a unicycling friend. I recently (2010·4) learned to unicycle. I started on a 24 inch Torker Unistar AX. This is a mid-level unicycle with a light aluminum fork and a 24 inch wheel. 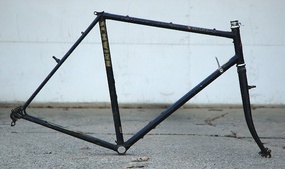 It is similar to the Unistar LX, but with a better frame. The Torker LX and AX are good choices for learning to ride, for freestyle unicycling, and for short easy rides on the local bike trail.